Asthma inhalers are used in both human and veterinary medicine for the treatment of asthma and other types of respiratory disease (e.g., bronchitis, etc.). Asthma inhalers often contain beta-agonist drugs (that expand the lungs) or steroids (that decrease inflammation in the lungs). When asthma inhalers are chewed on and punctured by dogs, it can result in severe, acute poisoning. 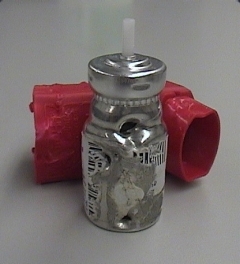 Because inhalers contain many doses (often 200 doses in one small vial), dogs that chew into them are exposed to massive amounts of the drug all at once. This can result in severe poisoning to pets, and often results in heart arrhythmias, a life-threatening elevated heart rate, agitation, vomiting, acute collapse and death. Severe electrolyte abnormalities such as very low potassium levels are likely and can be life-threatening without immediate veterinary treatment. If you suspect your dog chewed into an asthma inhaler, call your veterinarian or Pet Poison Helpline for life-saving recommendations. The sooner treated, the better the outcome.